Discussion in 'Alternate History Books and Media' started by sparkz9502, Jun 28, 2018. Spartakus is an upcoming alternate history modification for the popular strategy game Hearts of Iron IV. It is set in a universe where multiple post-Great War communist revolutions in Europe succeed, most notably in Germany. The Great War was a time of death and suffering, but also set the right conditions for what philosophers such as Karl Marx could've only dreamed of: World Revolution. Within only five years, two of the worlds major powers had been swept up in the red revolutionary tide. Now, the world stands deeply divided along ideological lines. The British Empire, seeing themselves a "bulwark" against the revolution, have expended much of their interwar resources on preventing additional revolutions across the globe. However, in 1929, the already struggling post-war economy had enough. In the infamous London Market Crash, whatever was left of the prosperity of Britain has withered away. Now, its Empire is threatened with collapse as its allies continue to distance themselves. In Burma, disgruntled socialists and monarchists have risen up in a full scale revolt against the crown, and it seems likely that the British reign in India will collapse in the coming years. In the Soviet Union, the party continues to struggle after the sudden death of Vladimir Lenin in 1931. Divided among various internal cliques, revolutionary politician Lev Kamenev has taken the reigns of the Soviet Union for the moment. How long his shaky reign over the party will last is up for question, but nonetheless an end to this power struggle is necessary for the Soviet Union to ever recover from the Russian Civil War. In Germany, the destruction of both the Great War and the Civil War is still quite visible. The Rhineland remains occupied under a French collaborationist regime, and Baden-Württemberg is under the local monarchy where the former Kaiser Wilhelm has taken refuge. Red Germany, or the FSRD, continues to dedicated most of its resources towards building Germany back to its former glory under the reign of revolutionary leader Rosa Luxemburg. This extended plan, however, has generated much discontent among the various represented groups, including the Bolshevik faction within the KPD, as well as the anarcho-syndicalist FAUD and the democratic socialist USPD. With the Russian Revolution in 1917 ending Russian involvement in the Great War, a red tide across Europe seemed inevitable. Under the guidance of revolutionary Vladimir Lenin, the Red Army clashed with the opposing White Army in what would become known as the Russian Civil War. This started a wave of revolutions from Germany, to Hungary, to Italy, to Persia, to Spain, to Portugal and beyond. In 1918, a battered German Empire signed an armistice with the Entente following the intervention of the United States in the previous year. With this, their fate was sealed. On the 9th of November, Emperor Wilhelm II abdicated, and the Weimar Republic was declared. This was not, however, the end. In the January 1919 elections, the Communist Party of Germany (KPD) emerged with over 24% of the vote. On May 1st 1919, a bloody year long Civil War would erupt, with the communists initially on the losing side. However, 1920 brought new hope, for the Red Army had emerged victorious in the war with Poland. With the Russian Civil War coming to a close, the Red Army swept into Germany, turning the tide rapidly. The unprepared western allies, economically battered with a war weary population, were unable to intervene until the very last moment, upon which a treaty was the only option. On the 19th of November, the final remnants of the "White Army" in Germany were defeated at the banks of the Rhine, and victory was declared by the KPD. Germany would now be known as the Free Socialist Republic of Germany. The reason 1932 was chosen was to give a relatively long "prelude" time of roughly four years, where most of the events that will shape the eventual meat of the game occur. This means that Civil War's will occur, power struggles will ensue, coups and revolutions will topple seemingly stable governments and colonies will rebel. Each and every event will ultimately shape the politics of every nation on the map one way or another. 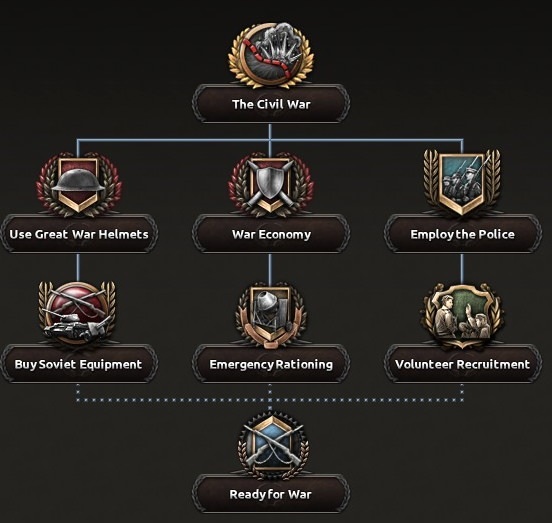 The goal is to include content lasting until at least 1945-1950, and the AI will be modified accordingly so it does not throw out mass amounts of divisions and slow down the game before the actual conflicts break out. With that said, you should not be expecting major conflicts to take until 1939 to break out, as many will break out much earlier. Since Spartakus is heavily inspired by narrative driven modifications such as Kaiserreich, it will host similar government systems, such as the Darkest Hour style cabinet. However, with the latest inclusion of a built in stability system, systems such as economic stability will be put in the place of the standard political power stability system and the party popularity system will receiving different effects and capabilities including a coalition mechanic between various parties of different ideologies. Spartakus will also extensively use the new decisions system to add on to the national focus system in order to make it more interesting during peace time. Zoidberg12, ajdb0614, Thon Taddeo and 11 others like this. Oh this looks neat, I'm loving the number of HOI IV scenarios popping up as of late. Welcome to the first update for this new alternatehistory.com page for Spartakus. There has already been months of work put carefully into this mod, and it would be foolish to not provide an update on what has been done prior to creating this page. Below, you can view all of the already completed Progress Reports and Dev Reports. All new Progress Reports/Dev Reports from now on will be posted here as their own article, so you won't have to worry about visiting Reddit every time you want an update on this mod (though please do anyway!). ibrahim4563, Zoidberg12, Admiral A. Kolchak and 11 others like this. I just spent the afternoon reading all the lore. I must say this is good stuff. I'm curious to see what you have planned for the other Great Powers such as Japan and the USA. 1. Can the Kingdom of Portugal win the civil war? Or will their victory follow a default focus tree. 2. Can Germany form it's own version of the Internationale and oppose the Soviets? Zoidberg12 and sparkz9502 like this. "In good news however, the socialist government under Rosa Luxemburg, who is an ethnic pole, has secured extensive and equal rights for all minorities in Germany including Jews and Poles, who were previously discriminated against under the German Empire. " In fact, Rosa Luxemburg considered national movements as petty-bourgeois and counterrevolutionary (unlike Lenin). Crying and sparkz9502 like this. 1. Yes, the Kingdom of Portugal will be able to win the Civil War and will have its own unique focus tree. Initially I was going to be posting a Progress Report with the monarchy being shown off, however I ultimately chose to delay that after exploring the capabilities of the 1.5 update for HOI4. Instead, I am hoping to be able to do a single Progress Report with the reworked Portuguese Republic and the Kingdom of Portugal included in one within the next few months. 2. It will, though the split will occur only in the case they emerge victorious against the western "reactionary" powers in the inevitable coming war. Germany starts off with its own faction, the "Rotfront" (name subject to change), which is between themselves, Bavaria, and the Austro-Bavarian socialist puppet state in Tirol. On the topic of Japan and the United States, we currently have an active developer on Japan and some well thought out plans for the United States that will hopefully be interesting when we can reveal them. I'll just throw a little hint out: a certain prominent motor vehicle businessman will be able to ascend to the presidency. Zoidberg12, Admiral A. Kolchak, Crying and 7 others like this. Zoidberg12, Admiral A. Kolchak and WotanArgead like this. Well I cannot give a super accurate estimate of how many will be added by the end but when taking in the fact this will be done in every part of Africa it very well could reach somewhere around 10,000. There has been over 1,000 new provinces in the areas completed so far (Gold Coast, Togoland, Dahomey, Northern Rhodesia, Bechuanaland, Tanganyika, Eritrea and Tunisia). Clearly there is a lot more to do and other neglected areas such as South and Central America and India are also subject to these types of overhauls. Zoidberg12, Miranda Brawner, Admiral A. Kolchak and 2 others like this. Oh nice seeing this here.I'm Kiridifferent,the (currently inactive)DEI/Indonesian revolters dev. sparkz9502 and WotanArgead like this. Hello, and welcome to the tenth Dev Report for Spartakus. Here is the link to last weeks Dev Report. Its me again, the not so funny German, with progress! Let's get right into the juicy stuff: A Focus Tree for Austria! Depending on what you choose, you'll be presented with the political and economical tree which will feature cool stuff like Crushing the Church, Make a state controlled workers’ union, privatize everything and of course reunite the nation. That's about it from me for this weeks DR, hope you enjoyed this brief overview. When I did the Progress Report for the Portuguese Republic, I was quite disappointed admittedly with what I had managed to show off. Both of the Portugal’s have a lot more potential, and although I am still actively working on Livonia, I feel I am in a good position now to go back for a little bit and give it the facelift it deserves on the side. One of the first things in this facelift is transitioning the Civil War focuses into decisions. Decisions work far better for what I am trying to achieve here, and unfortunately I had created this focus section before decisions were released. So, with that said, I would like to present the Civil War decisions for the Portuguese Republic. Keep in mind, the Portuguese Monarchy will be receiving a brand new focus tree and a similar decision list, so this isn’t only limited to the Republic. Both of these sections will be very important to consider. Rationing for example may work in the short term, but will garner some major unrest issues. This can be subverted by importing food from Germany or the Soviet Union, but at a higher cost. Ignoring this at all will result in a number of nasty events over the duration of the Civil War. Well, that is it for now. I will be working on compiling a brand new Progress Report hopefully within the next few months with all the new Portugal stuff, where I can finally show off the Monarchy tree. Keep in mind these decisions are WIP and may be changed or added on to in the future. During my First week here, I was able to implement my lore ideas regarding the current political situation in the United States. I was also able to fix the political wheel and party names. My Idea for the US is that the forces of mainstream democracy are too strong for most radical factions in US politics. However once the Stock Market crashes, the Unions, Leftists and Right Wing Populists could begin to have a substantial impact in the politics of the United States. Also I managed to write in a yearly Independence Day event. Love Live Democracy! That’s all for this week. Next week I plan on working on the focus tree following the election and the Military Branches. Coding for generals and leaders has already been done and the only thing left for these states is getting the colorized portraits in as well as events for the countries. The plan is that they will start out at war with each other, but depending on capitulation rates, they can white peace with each other to team up on others. To start with, a little backstory. I don’t want to take up too much space, so feel free to research yourself if you’d like, but the condensed version is: During the Great Depression (which hit Canada incredibly hard, arguably worse than it hit America) the government was less than competent and annoyed a good chunk of the workers. Some of them started a protest in Vancouver, which then turned into a trek from Vancouver ‘on to ottawa’. However, once they got to Regina, things went rather wrong and a riot happened – thus stopping the trek. As you might have expected, things don’t go so well. The decisions for this event aren’t quite done, but the two currently there basically show the main choices (set a trap or see if you can negotiate). The trap option is only available to the conservative government, which has a focus about expanding the RMCP in Regina – this is needed for the option to be available. Here’s the result of that focus. Bennett is the conservative party leader. Thinking about it, I’ve forgotten to explain what the RMCP is, so there’s an explanation. A) This revolt isn’t actually as serious as it would seem; it’s only at a division’s strength – the ramifications of this event are seen elsewhere, specifically in Canada’s government system likely completely collapsing. B) The protests at the start are triggered by other decisions made and laws passed (We’ve been given access to the CBTS parliament system; Canada’s laws are going to be implemented in that) during the political tree. If the government makes the right choices, they can avoid it. Anyway, that’s me done for this week, hopefully this’ll be the start of me posting in these relatively frequently! Zoidberg12, Crying, Gladsome and 4 others like this. How does the Parliament system work exactly? Well, this is interesting! Have to read up some more, but jesus that China is a mess! OK, so I think I get most of the ideologies, but could we have some clarification on that, please? The parliament system is used to implement various reforms and such through the decisions system. In democratic nations it is used to force compromises between the ruling party and other parties. Each party gets a certain number of seats and thereby, a certain amount of influence. This is due to Chiang Kai-shek's Northern Expedition never occurring as he never takes power due to a failed Canton Coup. Wang Jingwei instead is in power. If you want any clarifications for specific ideologies I am happy to answer. Question what happened to Serbia which made it so that it got shafted out of any gains from the War? Is that in any way correct? The lore behind that is following the mass red scare across Europe, Italy fought a short but decisive war known as the "Adriatic War" against Serbia using perceived "weakness" and the situation in Montenegro and Carinthia as justifications. The war has major repercussions in Italy even in 1932 (start date) due to it being perceived as unneeded, unwanted war, but nonetheless it leaves Yugoslavia divided up between an Italian aligned Croatia + Montenegro and Serbia. Italy will often fall into Civil War which gives the Serbs easy justification for unifying Yugoslavia relatively early on in the game. Sounds about right though it is worth mentioning Leninism includes more than just Stalinism and doesn't necessarily always equal the same level of authoritarianism Stalin used. Bernie Sanders and his supporters are Social Democrats (they are more to the right of the Scandinavian parties).